DISCLAIMER: Unless otherwise noted, information has been provided by an edition of the Hudson Owner Manual for Jet models. The Owner's Manual was specifically prepared to give the driver suggestions and information, helpful hints and ideas that would assist in enjoyment of the vehicle and ensuring lowest upkeep and operating costs. After market updates from other sources have been added as well and are credited in italics. HudsonJet.net provides this reference as a courtesy and is not responsible for any work done using Hudson Motor Car Company's publications or other sources provided on this site. You should know all about the instruments and operation of the controls before driving your car. So that you will be able to interpret each instrument reading and the proper function of each control, [it is] recommended that you read the following instructions carefully before driving your car. Depress the brake pedal and pull back on the hand brake handle to apply the hand brake. Place the gear shift lever in the neutral position. NOTE: On cars equipped with Hydra-Matic Drive, the engine will not start unless the selector lever is in the neutral "N" position. On cars not equipped with Hydra-Matic Drive, depress the clutch pedal fully. NOTE: If the engine is cold, depress the accelerator pedal at least one-half way and release pedal fully. 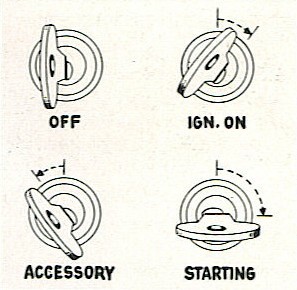 Turn the ignition key to the extreme right (starting) position to engage the starter. When the engine starts, release the pressure onthe key and the key will return automatically to the (igniton on) running position. NOTE: When starting a hot engine, or an engine which has been flooded due to pumping the accelerator pedal, depress the accelerator pedal fully while holding the ignition key in the cranking position, until the engine starts. After the engine has started, it will run at a high idle speed during the warm-up period. DO NOT race the engine. When the engine is warm, a slight depression and release of the accelerator pedal will permit the throttle to return to the normal idle. WARNING: Never run the engine in a closed garage. Carbon monoxide, a deadly, colorless, odorless gas is always present in the exhaust of the internal combustion engine. Garage doors should always be open when starting or running the engine. 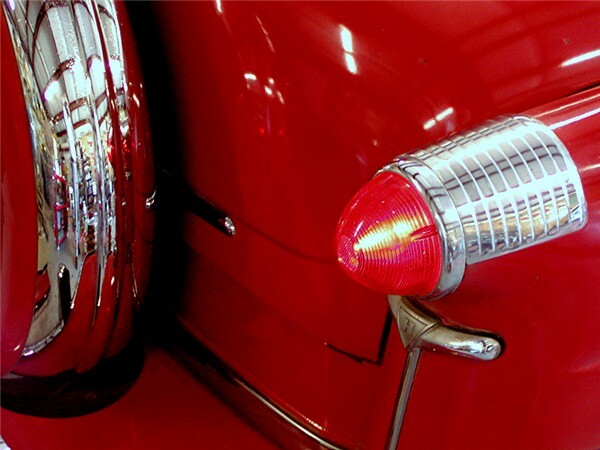 EMERGENCY STARTING: To start the engine by towing or pushing, on cars equipped with the manual shift transmission, disengage the clutch, place gearshift lever in high position, turn ignition key to "ignition on" position, push or tow the car at least 10 miles per hour and slowly release the clutch. For cars equipped with Overdrive see "Pushing or Towing." For Hydra-Matic equipped cars see "Pushing or Towing to Start Engine." After the engine has been started, depress the clutch pedal fully, raise the gear shift lever and move it forward for reverse gear or rearward for low gear, see figure at right for shift pattern. Always bring your car to a full stop before shifting into first (Low) gear. After the car is moving in foward speed, depress the clutch pedal, move the gear shift lever to neutral, then depress and slide the gear shift lever forward for second gear and rearward for high gear. NOTE: Driving your car at high speeds in low and second gear should be avoided at all times for better fuel economy and car life. When climbing a hill it is advisable to shift back to second gear or first gear depending on the grade. In this way you will not force the engine to labor. When descending a steep grade, shift to second or low gear. In this way the engine will be used to assist the brakes in slowing the car down. When starting on icy surfaces, start in second gear or high gear to reduce wheel spin and skidding. When backing up, depress clutch pedal, move gear shift up and forward "R" (Figure 32). Drive slowly in reverse, make sure all is clear behind you. NOTE: The car should always be fully stopped before shifting into reverse. If the car is equipped with Overdrive or Hydra-Matic Drive, follow Special Operating Instructions [by clicking on linked terms]. After starting a cold engine, faster warm-up and better economy will result if the car is driven immediately instead of idling or racing the engine. Keep the speed near 30 miles per hour until the engine reaches normal operating temperature. This is good practice at any time but especially necessary when the engine is new and the moving parts not worn in. For the first 250 miles keep the speed under 40 and drive as little as possible under 25. Between 250 miles and 500 miles the top limit may be increased to 50 and between 500 and 1000 miles, to 60 miles per hour. At least a third of the mileage of each period should be driven at or near the maximum speed recommended. Do not drive at constant speed for any length of time but vary the speed within the recommended limits. At no time during the first 1000 miles should the throttle be opened fully for quick accelerationg or hill climbing. The first 1000 miles are very important to your new engine and a little car during this time will pay off in added economy throughout a longer life. After the first 500 miles of driving, have the oil changed as it is good practice to have fresh clean oil in the engine before starting to drive at the increased speeds permissible during the second 500 miles of the break-in. The Hudson with Hydra-Matic Drive provides four forward speeds with automatic shifting of gears in all speeds. Control is by the selector lever located below the steering wheel which is used to select the forward speed ranges, neutral and reverse. 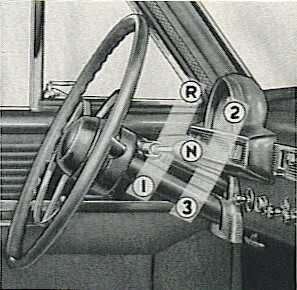 These positions are shown on the indicator dial at the top of the steering column and the pointer on the selector lever clearly shows which range the control is in. The five positions and their markings are as follows. N: Neutral and starting position. DR: Driving Range: Has two positions indicated by the letters "DR" and the figures 4 and 3 on the indicator dial. For all normal forward driving. LO: Low Range: When Maximum power is required, as when pulling in sand and up steep grades and when getting car in motion on icy roads. *Selector lever must be RAISED SLIGHTLY when going into low range. R: Reverse: Reverse position also used for holding car on grades. Selector lever must be raised slightly when going into low and reverse position. STARTING THE ENGINE: Apply hand brake. Place selector lever in the Neutral (N) position. The engine connot be started with the selector lever in any position but neutral, as a safety in any position but neutral, as a safety switch prevents the starter from operating. Should it become necessary to start the engine bypushing or towing the car, this can be done by moving the car with the selector lever in the "N" or Neutral position until a speed of approximately 25 miles is reached. Then turn on ignition and move the seletor lever either to the "DR-4" or "DR-3" range position (Never to "LO") and the engine will turn over. The possibility of damage due to sudden acceleration after the engine starts is avoided if the car is pushed instead of towed. Do not push or tow the car faster than 25 miles per hour. If, for any reason, the car has to be pushed or towed at higher speeds or if the transmission has not been operating properly, the propeller shaft mut be disconnected at the rear universal joint. After the engine has been started, move the selector lever to the "DR-4" position for normal forward driving. This position provides reduced engine speeds, greater fuel and oil economy and smoother and mroe comfortable operation. Moving the lever to the "DR-3" position provides better acceleration and handling in congested traffic and more effective control when climing or descending long mountain grades. When the accelerator pedal is depressed and the engine speed increased above idling, the car will moe forward. Shifting through all forward speeds is done automatically as the car speed increases. The car speeds at which shifts will be made depend upon the amount of depression of the accelerator pedal. When accelerating rapidly, the shifts occur at higher speeds than when accelerating slowly. If the engine begins to labor when accelerating at low car speeds or climbing steep grades in "DR-4", press accelerator pedal all the way to the floor board or move the selector lever to the "DR-3" position. The selector lever can be moved from the "DR" position to the other at any speed while on dry pavement. To stop the car, simply release pressure on the accelerator pedal leaving selector lever either in the "DR-4" or "DR-3" position and apply the brakes in the usual manner. This allows the engine to remain "in gear" and helps to slow down the car, especially in the "DR-3" range. CAUTION: Never leave the car with the engine running unless the selector lever is in the neutral or "N" position and the parking brake lever fully applied. This prevents the car from starting if the accelerator pedal is accidentally depressed. For quick acceleration when passing other cars or climbing grades, Hydra-Matic Drive automatically down shifts from 4th to 3rd gear when driving in the "DR-4" range and from 3rd gear to 2nd gear in the "DR-3" range, when the accelerator pedal is rpessed all the way to the floor. This feature is effective only at car speeds up to 60 miles per hour in the "DR-4" range and 20 miles per hour in the "DR-3" range. 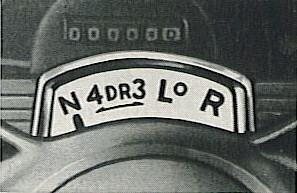 Letting up on the accelerator pedal automatically returns the transmission to 4th speed when in the "DR-4" range and to 3rd speed when in the "DR-3" position. In the low range ("LO") position, the transmission operates only in second and first speeds and will not change to third and fourth regardless of engine speed. This provides maximum power for climbing steep grades and pulling through deep sand, as well as increased engine braking for descending steep grades. It is also best for getting the car under way on icy pavements. Downshift to first speed may be made at car speeds below 10 miles per hour by pressing accelerator all the way to the floor. With the car standing, selector lever in "n" (Neutral), start the engine and while holding the car stationary with the foot brake, raise the selector toward the steering wheel and move it to the "R" (Reverse) position. It is not necessary to come to a complete stop before shifting to reverse, however, the selector lever cannot be moved to the "Reverse) position at speeds above 10 miles per hour. Turn the front wheels toward the curb, depress foot brake while applying the hand brake. For additional safety while parking, move the selector lever to the "R" position. This will permit "in gear" parking. IMPORTANT: When using "in gear" parking on an inclinde, hold the car with the foot brake for a few seconds after the engine is stopped, to permit proper engagement of transmission parts. By slightly depressing the accelerator pedal with the selector lever inthe "DR" position, it is possible to hold the ca from moving backward when stopping on slight upgrades. This practice, however, is not recommended on steep grades or for an extended length of time. Push in the Overdrive control knob at any car speed. Release the accelerator pedal momentarily an any speed above 22 miles per hour and the shift to Overdrive is completed. When slowing down the shift will be made back to high gear automatically at 18 miles per hour. If it is desired to revert to high gear above 18 miles per hour for rapid acceleration, depress the accelerator pedal fully. When the desired car speed is reached release the accelerator pedal and Overdrive will again become engaged. When Overdrive and free-wheeling is not desired, as in heavy traffic, on icy or slippery pavements or on steep grades, simply pull the Overdrive control knob out while the car is standing or moving at less than 18 miles per hour. If a clicking sound is heard after pulling the knob out, depress the accelerator pedal slightly to bring the engine speed up to the car speed and the shift will be completed. When driving at speeds above 22 miles per hour it is necessary to depress the accelerator pedal fully to revert to direct drive and then pull out the control knob. If steep grades are anticipated it is recommended that the Overdrive be locked out, by pulling the Overdrive Control Knob all the way out, both for better hill climbing while ascending and mroe braking effect from the engine while descending. NOTE: If additional braking is needed, shift to second or low gear. Before starting engine by pushing or towing on cars with Overdrive, pull Overdrive Control Knob all the way out.